Now the Air Travel is allowed for Central Government employees those who are in Level 6 (Pre Revised Rs.4200 Grade Pay) and above. It is Good News for those who are in Level 6 to 8, as the Travel entitlement for them so far is AC II by Train only. Now they are entitled to Travel By Air in Economy Class. The 7th CPC has recommended that Travelling Allowances can be continued without any changes. 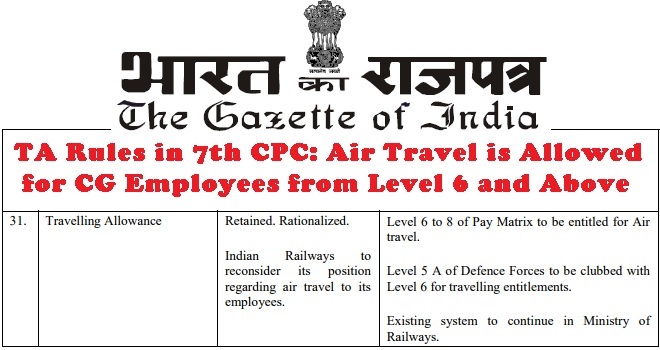 [See the 7th CPC Recommendation on Travelling Allowance and Existing Travel Entitlement ]. 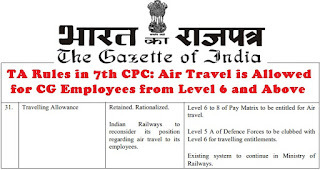 But the Government has decided to extend the Air Travel Entitlement to Govt Servants those who are in Level As per the Gazette Notification issued by Government of India, the Travelling allowance is rationalised to enable the Central Staffs from Level 6 to 8 to Travel by Air . The Official concerned clarified that, this Modified Travel Entitlement will be extended to LTC also. 31. Travelling Allowance Retained. Rationalized. Indian Railways to reconsider its position regarding air travel to its employees. Level 6 to 8 of Pay Matrix to be entitled for Air travel. Level 5 A of Defence Forces to be clubbed with Level 6 for travelling entitlements. Existing system to continue in Ministry of Railways. Now the Air Travel is allowed for Central Government employees those who are in Level 6 (Pre Revised Rs.4200 Grade Pay) and above. It is Good News for those who are in Level 6 to 8, as the Travel entitlement for them so far is AC II by Train only.